The latest FTA inspection report finds 'poor radio fidelity' and several other problems along multiple Metro lines. WASHINGTON – Metro radio problems go beyond the stretch of the Red Line where rail controllers struggled to contact the operator of a train that derailed last month. Federal Transit Administration inspectors twice found “poor radio fidelity and frequently encountered radio reception dead zones” while riding the Orange and Silver lines from downtown D.C. through Arlington, Virginia, this fall, newly available inspection reports show. Some other train operators could have difficulty hearing even properly functioning radios since one new train had loose door seals that meant whistling wind drowned out the train radio when traveling approximately more than 40 mph. In several parts of the system, tripping hazards remain in the event of an evacuation, such as extra pieces of rail sitting in the middle or on the edge of the track bed. In one case, another piece of extra rail sat just a few inches from the electrified third rail. The inspection reports from October and November also found missing or expired elevator inspection certificates for four elevators at Friendship Heights, two elevators at Pentagon, three elevators at Pentagon City, two elevators at L’Enfant Plaza and two elevators at Archives. As in previous inspections, the FTA found that some prior issues were cleaned up. But there were other continuing problems: areas where mud caked around the electrified third rail; areas where water backed up or dripped onto the tracks; or batches of deteriorated fasteners meant to hold the rail in place. On the Silver Line, which Metro accepted and opened in 2014, FTA inspectors noted the fasteners on bridge structures are beginning to show signs of failure. Several areas have already been corrected. On the Blue Line near Braddock Road where trains can switch from one track to another, major rail tie problems were noted Oct. 12 that appeared to be similar to the issues that contributed to a July 2016 derailment near East Falls Church. At the other end of the line, near Benning Road, inspectors found issues near newly installed fasteners, mud and silt up to the third rail showing signs of electricity flowing through it and significant fastener issues in a curve. On the Red Line between Friendship Heights and Woodley Park, a significant amount of water backed up from drains and one of a few tunnel leaks dripped onto the tracks “allowing severe corrosion” of one of the rails down to its base. A similar issue was noted Nov. 11 near Medical Center. Metro’s preliminary investigation found that rust was an apparent reason a rail shattered near Farragut North Jan. 15, leading to the Martin Luther King. Jr. Day derailment. Overall, Metro has 909 specific open remedial actions identified by the FTA and 155 broader required corrective action plans that either have yet to be approved or submitted as of the end of November. Six of the remaining corrective action plans were under review by the FTA, 127 were past Metro’s original target date and 22 were not yet due. Metro trains displayed the wrong speed limits for operators during a series of checks that also showed some operators were not aware of or following all technical requirements. Federal investigators noted a series of issues where trains were showing zero for speed commands, which requires train operators to radio in for permission to move in most cases. In other cases, new trains showed speed limits of 75 miles an hour, even though the top authorized speed is 59 miles an hour. In each of those instances, inspectors found train operators followed proper procedures. However, several did not know they were supposed to carry around a large pile of papers detailing operating rules and procedures, and there were certain circumstances where train horns were not sounded at required times. Other operators were not carrying required flashlights. On the Blue Line, a train operator did not see the flash from a system meant to warn that there are workers ahead. Safety procedures became a big focus for federal investigators this fall, and while they noted a number of successes, they also found some risky situations. In one case, a worker who was supposed to be warning trains of workers on the tracks ahead had failed to do so. 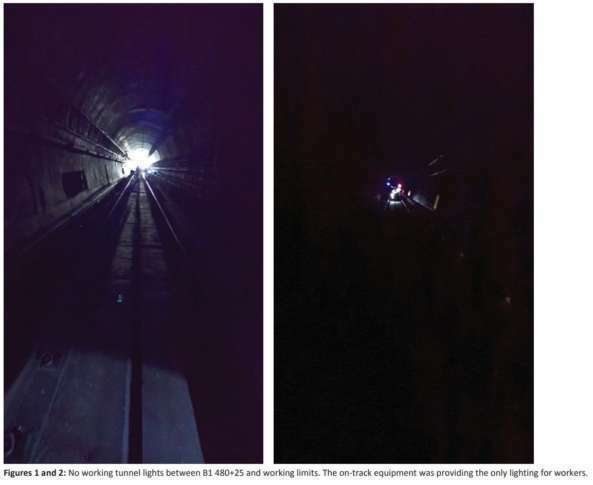 In another, on the Red Line in Montgomery County Oct. 1, work crews in a dark tunnel where few lights were working used gas-powered machines and left a diesel maintenance vehicle running to light the work area without any ventilation. Federal inspectors were concerned the crews might have been exposed to carbon monoxide or other exhaust fumes and immediately called for the ventilation fans to be activated. The workers were only wearing paper filter masks, and there did not appear to be any air monitoring devices available that would have served as a canary. Metro now has a cleaning and testing program for tunnel wall lights meant to improve visibility for workers or in the case of evacuations. As of November, special scaffolding built to maintain key parts of the new 7000 Series cars only accessible from the roof remained out of service at the New Carrollton Rail Yard due to safety concerns. Metro was building new, similar scaffolding elsewhere and planning to upgrade the New Carrollton facility. At New Carrollton, an FTA inspector found a ceiling heater got in the way of some work being done and access ladders for the scaffolding needed improvements. On top, extenders meant to close the gap with a train when it is not lifted also were not working properly, so new rollers had been ordered. The particular part of the facility was due to switch to working on maintenance machines in December.